Want Unique Wedding Flowers that Last? Floral arrangements are one of the most beautiful and special parts of any wedding ceremony. Sadly, over time, flowers fade, and all that remain are pictures or dried keepsakes to remind you of your wedding arrangements. However, one Hendricks county artisan is creating floral art that will last years beyond your wedding day. Avon resident Karen Pedevilla is the artist behind Pedevilla Clay Artistry, formerly Clay Petals. Pedevilla creates sculpted clay flowers that are as beautiful and life-like as the real thing. Clay flowers are a great alternative to fresh flowers, because they have all of the natural beauty of florals, but you can enjoy them for years after your wedding, and even pass them down. What Can Pedevilla Clay Artistry create for your wedding? Anything that can be made with "real" flowers can be re-created by Pedevilla Clay Artistry. You could opt to have clay art for all of your wedding&apos;s flowers, or you could focus on a few key pieces you&apos;d like to preserve, like your bridal bouquet. 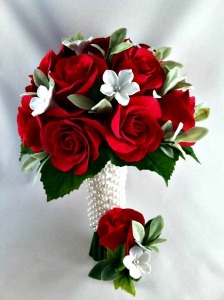 Karen is able to create bouquets, boutonnieres, cake toppers, centerpieces, favors, hair accessories, and more. I love the idea of a bridal bouquet that will last forever, or lovely handmade favors for bridesmaids that they can enjoy beyond the day of the ceremony. What else can Pedevilla Clay Artistry create? 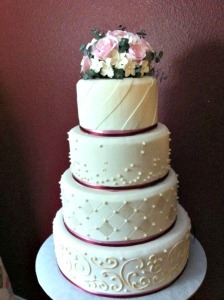 Karen&apos;s skills and services extend well beyond weddings. Karen can create arrangements, wall art, shadow boxes and wreaths for the home as well as flowers for all kinds of special occasions, from baby showers to birthdays. With Valentine&apos;s Day right around the corner, a handmade clay arrangement that will last forever might be a great alternative to the traditional dozen roses. Hendricks County is fortunate to have many talented artists like Karen, creating things that enhance our celebrations, our homes and our lives. To see more of Pedevilla Clay Artistry&apos;s creations, be sure to follow their website, blog, and Facebook page. For any and all of your wedding needs, don&apos;t forget to include Visit Hendricks County in your planning. They have a Bridal Services Guide listing any and every bridal service available in Hendricks County including Pedevilla Clay Artistry. They can even help with hotel room blocks and welcome bags for your out-of-town guests. For more information about all their services, click here.